This USB duplicator and eraser lets you clone or erase up to seven USB flash drives, without a host computer connection. This means you can work more efficiently and manage larger batches of USB drives, saving time and effort. The standalone USB duplicator and eraser is perfect for IT professionals and system administrators in corporate, education, marketing, or sales environments. 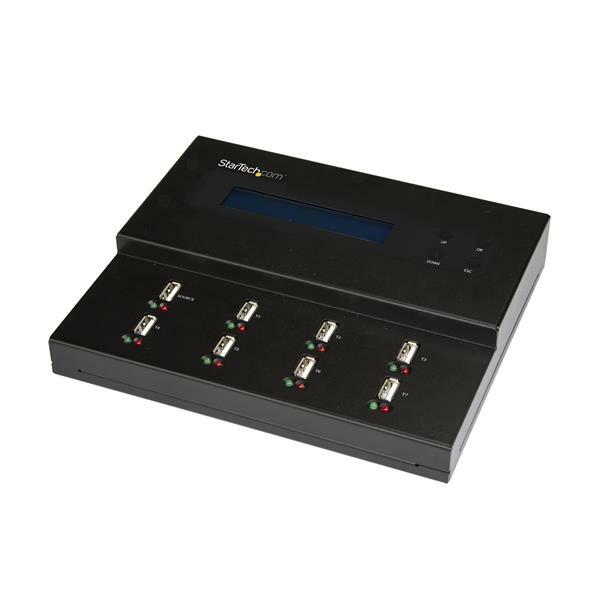 The duplicator lets you copy up to seven drives simultaneously, and offers both synchronous and asynchronous duplication, with speeds up to 1.5GB per minute. The asynchronous feature means you can remove and replace USB storage devices while other copies continue to run. The eraser/duplicator offers two modes of duplication: system and file and whole file. The drive duplicator/eraser lets you erase up to seven flash drives at the same time, so it’s easy to clean large batches of USB drives for reuse. 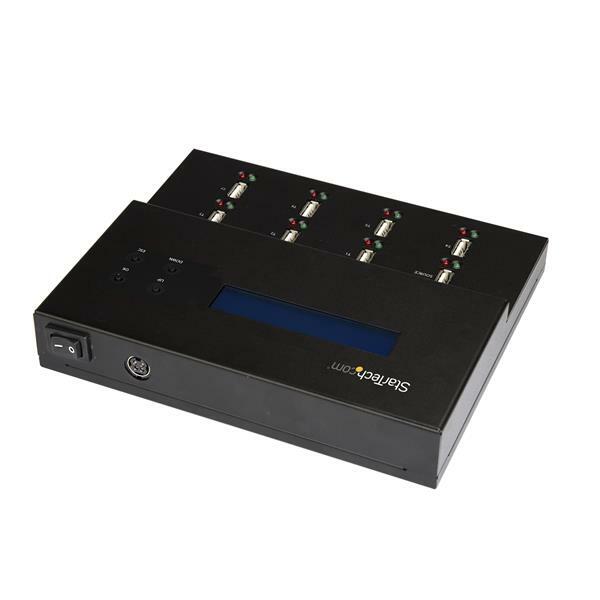 The flash drive duplicator features three modes of erasing: quick erase, single pass erase, and multi-pass erase (meets DoD standards). The flash drive duplicator and eraser supports USB 3.0, USB 2.0 and USB 1.1 flash drives, providing an easy and cost-effective way to re-use and re-purpose your USB drives. It features a robust metal housing and a compact, standalone design that makes it the perfect desktop companion. The duplicator/eraser also has an LCD display that makes it easy to monitor erasing and duplication to ensure completion. The USBDUPE17 is TAA compliant and backed by a StarTech.com 2-year warranty and free lifetime technical support. System and Cable Requirements For duplication, the destination drives must be of equal or greater capacity than the source drive.